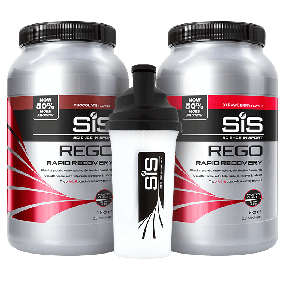 REGO Rapid Recovery Plus provides a complete recovery product to be consumed immediately after prolonged or intense exercise when you need to replenish your energy stores and promote muscle recovery. Contains a blend of Carbohydrate, Whey Protein, BCAAs, L-Glutamine with vitamins and minerals. 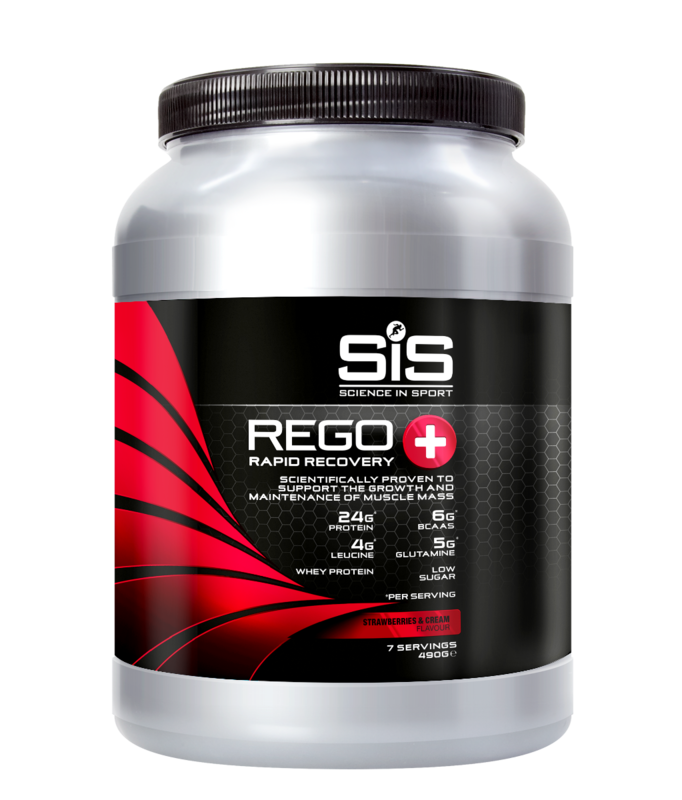 Consume 1 x 70g serving (3 heaped scoops) of REGO Rapid Recovery Plus within 30 minutes of completing your tough training session/competition. Mix with 500ml of water, mixing it with milk will slow down the absorption rate. REGO Rapid Recovery Plus contains high quality whey protein concentrate, which has a complete amino acid profile to which we have added an additional 2g of leucine and 5g of L-Glutamine to support muscle protein synthesis. Leucine is an amino acid which is known to switch on the signalling for muscle protein synthesis and L-Glutamine is known as the one of the most abundant essential amino acids, with anti-catabolic and immune properties. The blend of carbohydrate, protein, L-Glutamine and BCAAs thereby provides a recovery formula that can promote replenishment of muscle glycogen stores, muscle protein synthesis, gut function and rehydration. Carbohydrate is your muscles main fuel for moderate to high intensity exercise. During training and competition, our bodies can absorb around 60-90g of carbohydrate per hour, meaning that demand will outstrip the supply of energy. This shortfall is met by using your glycogen stores, which must be replenished post exercise so you are able to perform well in your next session. REGO Rapid Recovery Plus is tested under the Informed Sport Certification program. This approach involves testing every single batch of Science in Sport finished product which leaves the Company's factory, screened against the 2017 World Anti-Doping Agency (WADA) list. Banned substances including steroids are tested to the level of 10 Nanograms per gram, and stimulants to 100 Nanograms per gram. Batches (sampled at the beginning, during and end of each product batch) receive the recognised and respected Informed Sport certificate and Science in Sport provides the documentation to athletes on request. REGO Rapid Recovery Plus should be taken within 30 minutes for finishing exercising. It should be taken after high intensity or prolonged training sessions and competition where you have depleted your carbohydrate energy stores. It is highly relevant for those athletes who need to recover quickly in order to prepare for another training session or competition period. What is the difference between REGO Rapid Recovery Plus and REGO Rapid Recovery? REGO Rapid Recovery Plus provides all of the benefits of REGO Rapid Recovery, but with increased carbohydrate content, use of whey protein and inclusion of additional Leucine and L-Glutamine. 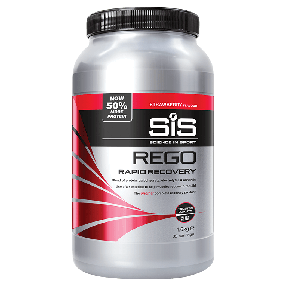 REGO Rapid Recovery Plus should be considered by athletes who are looking for an 'all in one' product to facilitate recovery after intense exercise by simultaneously promoting muscle glycogen re-synthesis, muscle protein synthesis and rehydration. It is relevant for both endurance and team sport athletes. L-Glutamine is the most abundant non-essential amino acid found in muscle tissue. During periods of prolonged and intense exercise, both blood and muscle stores of glutamine can become depleted and remain reduced in the post-exercise recovery period. Glutamine is also an important energy source for immune and gut cells. L-Glutamine supplementation can help replenish the diminished Glutamine stores post-exercise. Glutamine supplementation before and after exercise may therefore improve muscle (promoted muscle recovery), immune and gut function. What are the benefits of added Leucine? Leucine is the main BCAA that is used to produce energy during exercise and is also the key amino acid that stimulates muscle protein synthesis in the post-exercise recovery period. What is the difference between REGO Rapid Recovery Plus and Whey Protein? Use REGO Rapid Recovery Plus when the aim is to quickly replenish your carbohydrate energy stores alongside promoting muscle recovery by also consuming protein. If your goal or activity does not deplete energy stores but you are still aiming to maintain muscle mass and promote muscle recovery by stimulating protein synthesis, then Whey Protein may be a better option. What type of protein does this use? REGO Rapid Recovery Plus uses whey protein concentrate, which is a high quality protein source that is rich in BCAAs. REGO Rapid Recovery Plus contains milk (whey protein concentrate) and is unsuitable for vegans. Add 70g (approximately 3 scoops) to 500ml of water and mix well. REGO Rapid Recovery Plus contains 24g of protein in total.